Which new wildlife plates? You decide! The state’s wildest license plates are being redesigned, and your help is needed. Georgians can vote here on proposed designs for the next generation of wildlife plates. The deadline to vote is Sept. 15. Those votes will help the state Department of Natural Resources choose four new tags – two benefiting the Nongame Wildlife Conservation Fund, and one each for the Bobwhite Quail Initiative and trout management. The changes, expected by early 2013, take advantage of the state’s switch to what is called a full-plate design. The artwork on current specialty plates covers only a small part of the tag. Georgia’s wildlife plates provide critical funding for conservation, particularly for nongame wildlife – species not hunted, fished for or trapped – and bobwhite quail, the state game bird. Since 1997, the nongame plates – currently the bald eagle and ruby-throated hummingbird tags – have supplied 61 percent of Nongame Conservation Fund revenue. Wildlife Resources’ Nongame Conservation Section depends on the fund to conserve, research and restore rare animals, plants and natural habitats statewide. The agency receives no state appropriations, relying instead on grants, private contributions, special fundraisers and the wildlife plates. Review Nongame's work in this 2011 annual report. The same is true for Wildlife Resources’ Bobwhite Quail Initiative, which is working to stem bobwhite population declines by restoring landscapes of native grasses, forbs and shrubs referred to as early successional habitat. Reggie Thackston, Private Lands Program manager and bobwhite project coordinator, said that, as with nongame, no state appropriations are spent on BQI. “The tag revenue is absolutely critical as it is the primary source for restoring bobwhite habitat, which helps not only bobwhites but numerous other wildlife species that depend on early succession,” Thackston said. The hope is the new-look designs spur new and continued support for Georgia wildlife. It begins with your vote. The first Georgia wildlife plate, featuring a quail in a longleaf pine forest and benefiting the Nongame Wildlife Conservation Fund, was introduced in 1997. The eagle plate came out in 2003, the hummingbird in 2006, and BQI’s deer/quail plate and the Trout Unlimited tag in 2001 (two of the proposed new designs shown at right). Voting on the new designs requires filling out a short survey. For nongame, two new tags will be chosen. While voters can pick only one in the online survey, DNR will choose two from the most popular designs. Learn more about supporting wildlife conservation in Georgia. An effort to catch some of the first Indiana bats seen in Georgia since the 1960s came up empty-handed this summer. But researchers aren’t discouraged. A team including DNR, the U.S. Forest Service, the U.S. 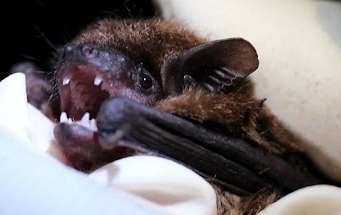 Fish and Wildlife Service and volunteers was following up on the discovery in spring of at least one and likely more Indiana bats at Rich Mountain Wildlife Management Area (“State’s first Indiana colony,” May 4). The WMA is part of the Chattahoochee National Forest near Blue Ridge. The endangered species had last been documented in Georgia’s Dade County in 1966. Biologists conducted three mist-netting sessions at Rich Mountain, hoping to confirm what appeared to be a maternity colony. Though no Indianas were captured, other species were – big brown bats (above), eastern red bats, evening bats, little brown bats and northern long-eared bats. The sessions provided important information about the area’s bat community, as well as discussion about future work involving Indiana bats. Indianas could also figure into DNR’s monitoring for white-nose syndrome, or WNS, a disease that has killed millions of bats but has not been documented in this state. As WNS spreads south, biologists will spend the winter looking for evidence of the disease in Georgia bats. Last winter, it was found in Tennessee and Alabama counties along the Georgia state line. WNS has greatly affected Indiana bats in the Northeast. One question is how the species’ more southern populations will respond to the disease. The Indiana bats tracked into Georgia and Alabama emerged from a cave in Tennessee. And it’s possible that hibernacula could be affected by white-nose this season. The wonder-birds are at it again. Three whimbrels outfitted with transmitters flew nonstop for up to six days and more than 2,500 miles through the heart of the Atlantic while migrating to South America, says the Center for Conservation Biology. 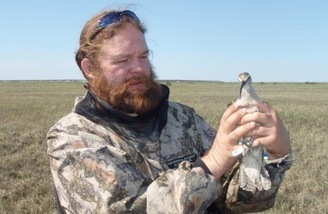 The three are part of a project involving the DNR and tracking more than 20 whimbrels to discover migration information that can help conserve this declining species ("Whimbrel 1; hurricane, 0," August 2011). Butterfly counts are up at the Power of Flight grassland restoration area on Panola Mountain State Park, near Stockbridge. An Aug. 8 count recorded 60 species, a high number attributed to the site’s restored native grasses and use of controlled burns to maintain the grassland. Georgia reptile and amphibian totals are also on the rise, due to discoveries and taxonomic changes. According to senior biologist John Jensen of the Nongame Conservation Section, Georgia now has 175 native herp species overall, second only to Texas, and 87 amphibian species, just behind first-place North Carolina. Candidate Conservation Agreement with Assurances for the rare sucker on the upper Ocmulgee River. A letter supporting the State & Tribal Wildlife Grants program fielded signatures from more than 425 organizations. The U.S. House Appropriations Committee has voted to slice funding by half in fiscal year 2013 – adding to cuts of 31 percent since 2010 – for State Wildlife Grants, the key federal program helping states conserve at-risk wildlife. Botanists Lisa Kruse and Tom Patrick of the Nongame Conservation Section will help lead sessions at the Georgia Naturalist Rally Sept. 15 at Stone Mountain Park. The event sponsored by the Stone Mountain Memorial Association features walks and talks with subjects varying from native plants to backpacking. The Agroforestry & Wildlife Field Day Sept. 20 at the University of Georgia’s Griffin campus also includes speakers from the DNR’s Wildlife Resources Division. Landowners and others can learn how to increase the value and benefits of their land with topics such as prescribed burning, cost-share assistance programs and dealing with invasive wildlife. Loggerhead sea turtles have topped 2,180 nests this summer in Georgia, easily breaking last year’s 1,992 count, the previous record high since comprehensive monitoring began in 1989. Of the estimated 183,788 eggs laid – a total that includes all sea turtle nests on the coast – more than 76,700 hatchlings emerged. On the downside, sea turtle strandings in Georgia reached 164, the most recorded from Jan. 1-Aug. 18 since at least 2007. Three of the eight turtles found dead or injured during the most recent week showed signs of being hit by boats, a leading threat. 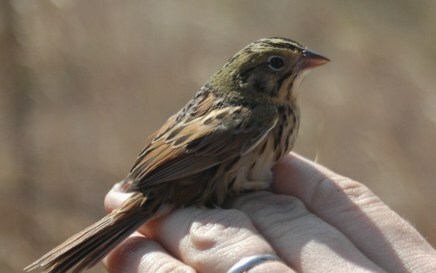 Want to see what bird banding is all about? Contact Georgia Important Bird Areas Coordinator Charlie Muise (email) for banding dates at Panola Mountain State Park in Rockdale County and Joe Kurz Wildlife Management Area in Meriwether County, plus a few days at Jekyll Island. Sea oats provided by The Environmental Resources Network and planted at Jekyll Island’s Great Dunes Park last year are thriving, says TERN board member Patricia Deveau (left). 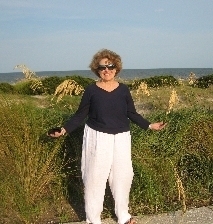 The restoration work coordinated through the Jekyll Island Authority and involving Coastal Wildscapes, the Georgia Plant Conservation Alliance and TERN included other native plants, as well. Aug. 29: 9 a.m., Georgia Board of Natural Resources, DNR offices, Atlanta. Agenda. (+video) "Whale of an (old) time," Albany Herald. WALB-TV video of Flint River discovery. "Hellbender is canary in coal mine of stream health," Seattle Times (pick-up of AJC hellbender article). Wildlife Management Area near Colquitt and Birdsong Nature Center in Thomasville. other rare wildlife in our state.